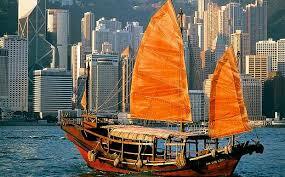 Hong Kong is the first Special Administrative Region (SAR) of China, the other being Macau. Before the transfer of sovereignty over to China in 1997, Hong Kong had been a British Colony for nearly 150 years. As a result, most infrastructure in Hong Kong inherits the design and standards in Britain. During the 1950s to 1990s, the city-state developed rapidly, becoming the first of the "Four Asian Tigers" through the development of a strong manufacturing base and later a financial sector. Hong Kong is now famous for being a leading financial centre in East Asia, with the presence of local and some of the most recognized banks from around the world. Hong Kong is also famous for its transition port, transporting a significant volume of exports from China to the rest of the world. With its political and legal independence, Hong Kong is known as the Oriental Pearl with a twist of British influence in the culture. The Hong Kong Special Administrative Region (SAR) is much more than a harbour city. The traveller weary of its crowded streets may be tempted to describe it as Hong Kongcrete. Yet, this territory with its cloudy mountains and rocky islands is mostly a rural landscape. Much of the countryside is classified as Country Park and, although 7 million people are never far away, it is possible to find pockets of wilderness that will reward the more intrepid tourist. A treat for the family. Hong Kong Disneyland offers a world-class, unique family entertainment experience inspired by the original Disneyland in California. It will feature some of the best & classic attractions & entertainment from other Disney parks around the world but made more relevant for the guests in this region. The result is a familiar yet entirely fresh Disney experience. Hong Kong Disneyland is designed for guests to leave the outside world behind and enter a world of yesterday, tomorrow & fantasy.